Happy New Year.....!!! 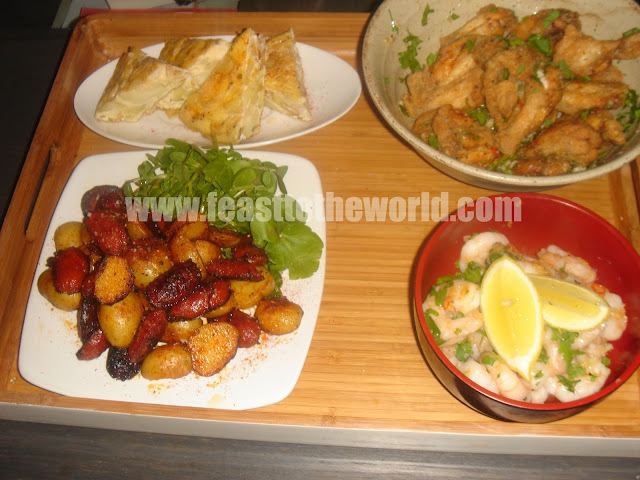 This is my first post for the year 2012 and I thought I'll shared with you what I've made for my New Year's Eve supper. There is a tradition in my household that on New Year's eve, there will be minimum laborious and tedious cooking. Just simple and delicious food that can be pick up and eat as and when as we sit in front of the TV doing the inevitable countdown. Spanish Tapas fit this bill perfectly. 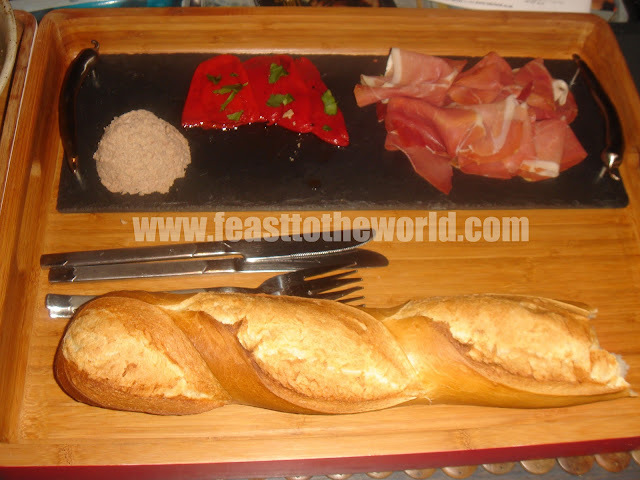 I have made four of the dishes and bought some good quality Piquillo peppers, Ibérico ham and paté. The last thing I want to do on New Year's eve is to slave over a hot stove. Munching through these delicious feast while watching Caro Emerald performing on Jool's Holland's Hootenanny has been one of the few great highlights on this very last day of 2011. All good Spanish ingredients are available in Garcia Deli on Portobello Road or Brindisa in Borough Market, both have excellent selections on their website too. Heat up the oil for deep frying to 180°C in a large pan or a deep-fryer. Dust the wings with the flour and deep-fry for 10 minutes, until cooked through and folded brown. 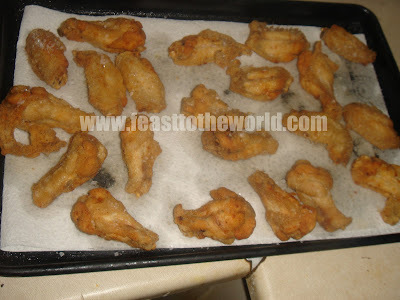 Alternatively, the wings can also be cook in a 200°C oven for 35-40 minutes after dusting them in flour for a much healthier option. Remove and drain on kitchen paper and season with salt and pepper. 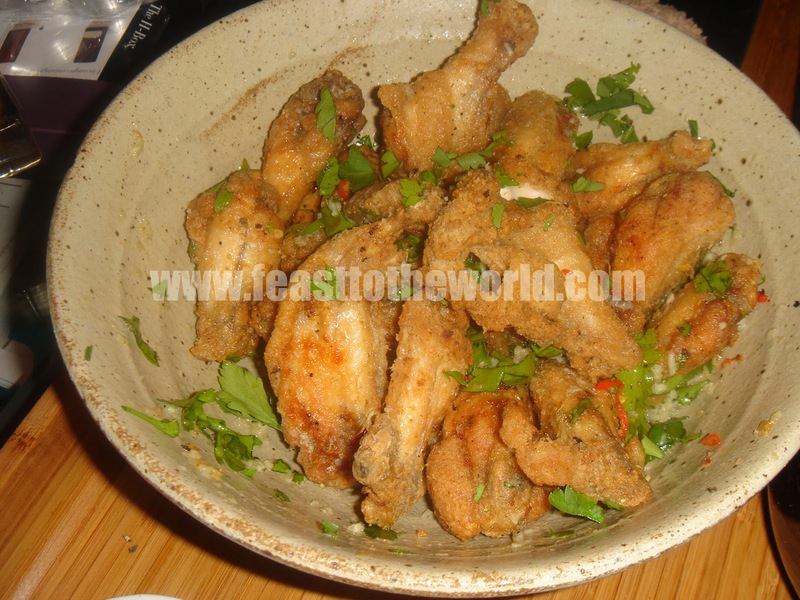 In a mixing bowl combined the chilli flakes, garlic, parsley and lemon juice. Add the chicken and stir well. Serve immediately. Heat the sunflower oil in a large, heavy-bottomed pan until it is just beginning to smoke. Add the potatoes and onions and fry, stirring often, for about 15 minutes, until golden brown. Remove the pan from the heat and leave to cool a little, then take the potatoes and onions out of the oil with a slotted spoon and drain on kitchen paper. Beat the eggs in a large mixing bowl. Add the potatoes and onions and season well with salt and pepper. Heat a little olive oil in a 20cm diameter frying pan, preferably non-stick. add the egg mixtures and cook over a medium heat until it is just beginning to thicken and set - about 5 minutes. Place a large plate over the frying pan and carefully but gallantly tip both the plate and pan over so that the tortilla ends up on the plate, cook side up. Do not hesitate when flipping or it will all ends up horribly wrong. Slide the tortilla back into the pan and cook for another 5-6 minutes. When cooked, the tortilla should just be set but with the slightest wobble and still a little runny in the middle. Carefully slide onto a plate and serve warm. Bring a pot of water to the boil. 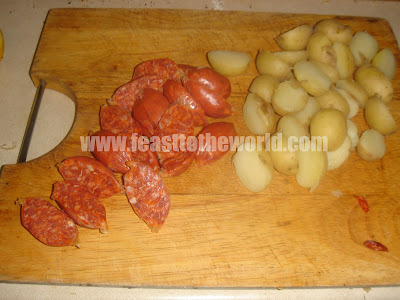 Cook the potatoes, drained and cut into half lengthways. Cut the chorizo into half lengthways. In a large frying pan, heat up 4 tablespoons of olive oil until beginning to smoke. Add the potatoes, season with salt and pepper and cook until nicely golden brown, about 5 minutes. Add the chorizo and fry for another 2 minutes. Add the butter and shallots and cook for another 5 minutes. stir in the parsley and remove from heat. 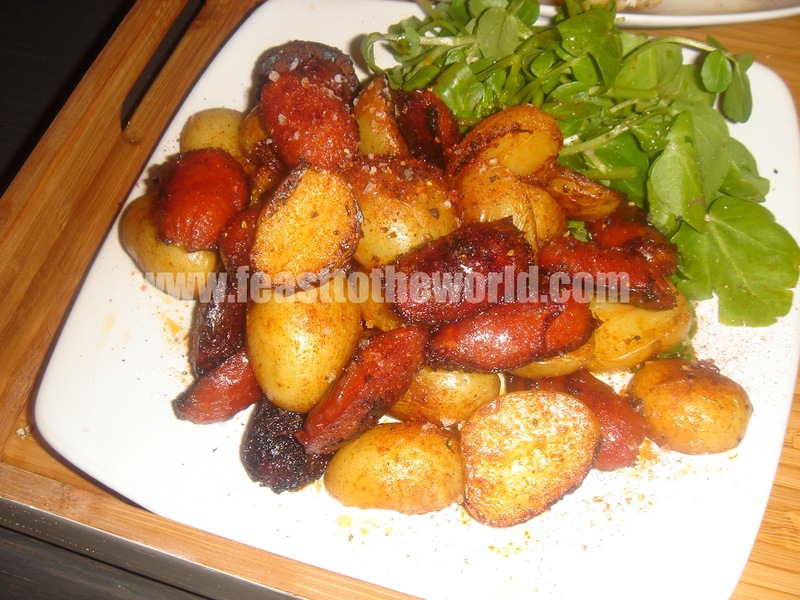 Drizzle the watercress with a little olive oil, sprinkle with a pinch of salt and serve with the potatoes and chorizo. Spoon a little of the cooking oil from the pan over the dish for extra flavour. 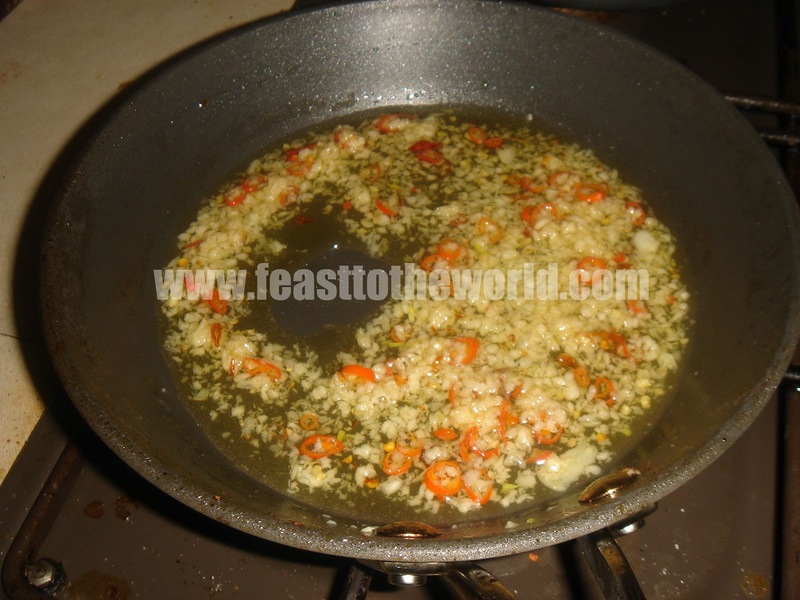 Heat the oil in a large frying pan and add the garlic and chilli. Cook over medium heat for 1 - 2 minutes until softened, taking care not to burn the garlic or it will taste bitter. 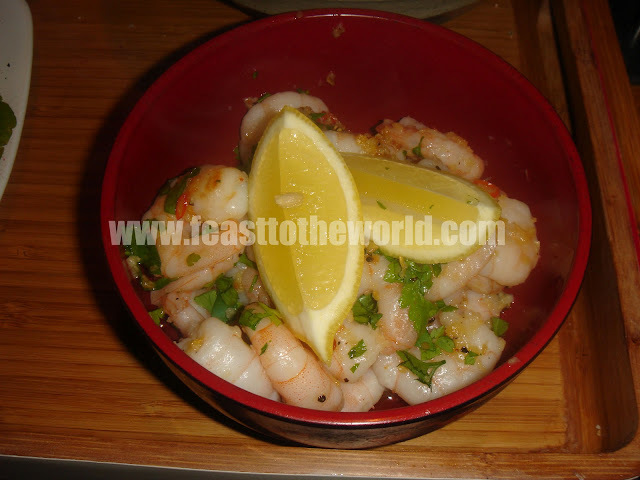 Add the prawns and cook for just 2-3 minutes, turning halfway, until thoroughly cooked and pink throughout. Tip into a serving dish and sprinkle with the parsley. 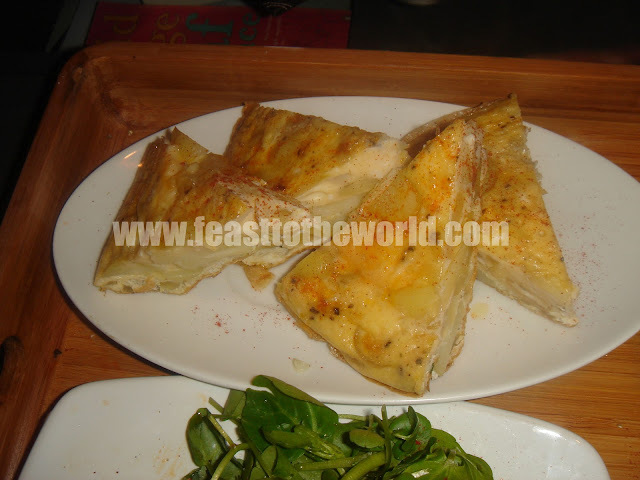 Serve with lemon wedges and lots of crusty bread to soaked up the juices.